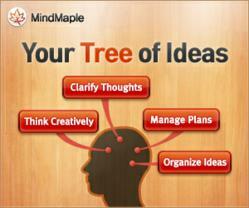 MindMaple Inc., the creators of the popular mind mapping product line have released the full version of their successful MindMaple iPad app. MindMaple Inc., the San Francisco based mind mapping software company have officially launched the their newest app for the iPad community, called MindMapleHD for iPad. The majority of their previous software development has focused on Windows based platforms. This product has been developed specifically to bridge the gap between their customers Windows based computers and the ever growing iPad market. MindMapleHD for iPad is a fast and intuitive way of organizing and prioritizing information for project management, brainstorming sessions, ideas sharing, lesson plans drafting, lecture note taking, problem solving, schedules managing and much more. It gives users the ability to create and edit collaborative mind maps with a user-friendly interface and numerous features to assist in simplifying complex ideas and concepts. A company spokesman reported the product is going to remain free for a limited time and is currently available for download via their website or directly off of the iTunes store. More product information can be obtained via their website at http://www.mindmaple.com. You can "Like" them on Facebook at http://www.facebook.com/MindMaple and "Follow" them on Twitter at http://www.twitter.com/mindmaple. Additional information, questions or comments should be directed to support(at)mindmaple(dot)com.